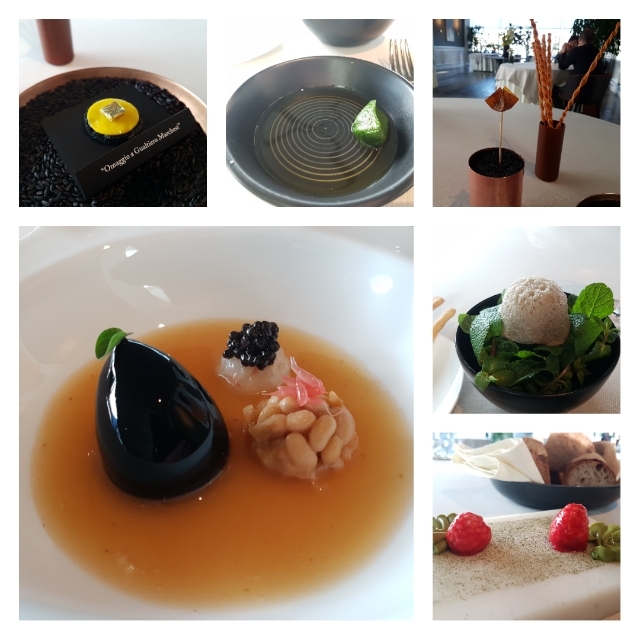 Having enjoyed a breakfast of samples of the finest wares of Fratelli Branca at their distillery, I was in need of much lunch finery so headed to Mudec, a gallery and arts complex, which is home to the eponymous 2 Michelin restaurant of chef Enrico Bartolini. The restaurant space was on the light airy top floor with both interior and terrace seating. On a chill January day, the terrace seating was not the order of the day. I was shown to a smart table by a combination of the friendly front of house staff team. Throughout they were warm and friendly, giving a real sense that they were enjoying their work. Chef Bartolini also popped out to say hi to all the tables and did a couple of check-backs during service. Service was packed with theatre with the first item – bread sticks – served from a little treasure chest. We then had a highly elaborate aperitivo sequence comprising various elements. This included turnip top emulsion with nocellara olive oil into which you dipped steamed tomato stuffed bread. Then there was a crisp onion wonton stuffed with foie gras. Then a dish of gold, saffron and rice in tribute to chef Gualtiero Marchesi. Then finally a dish of aubergine, smoked grapefruit sauce, tartare and caviar, and beans. These were slightly bizarre but all kinda wonderful. I’d opted for their seasonal “hunting” tasting menu. This started with an amuse bouche of venison tartare with lime and cabbage gels. This was beautifully presented and a riot of flavours. Next we had one of the kitchen team deliver and cut the first of two breads. This was a white bread made from three local grains. It was served with incredible raspberry and matcha butters. 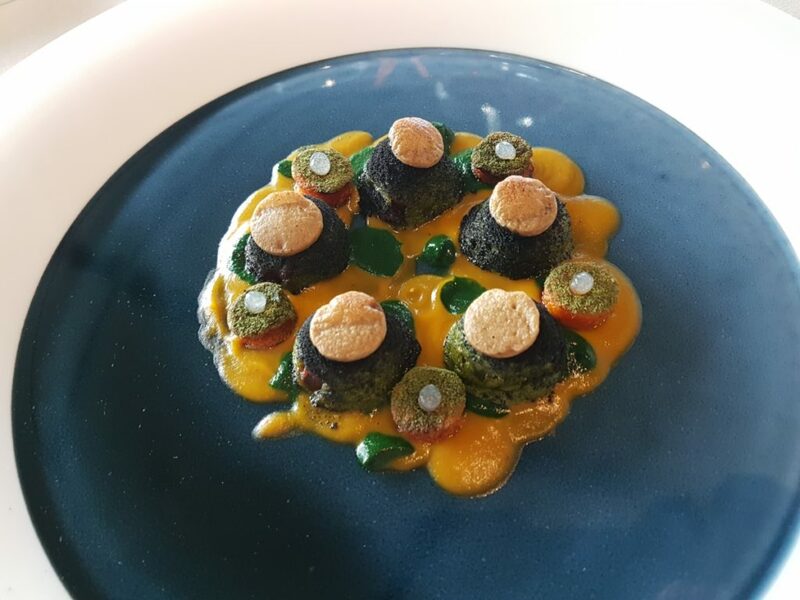 Next was another outstanding dish with duck tongue stuffed cavalo nero gnocchi, foie gras, pumpkin cream and porcini mushrooms. Another beauty was guinea fowl breast topped with chanterelles, the neck and liver of the beast, bean and parsley sauces, a stock reduction and herb dust. It was fantastic. 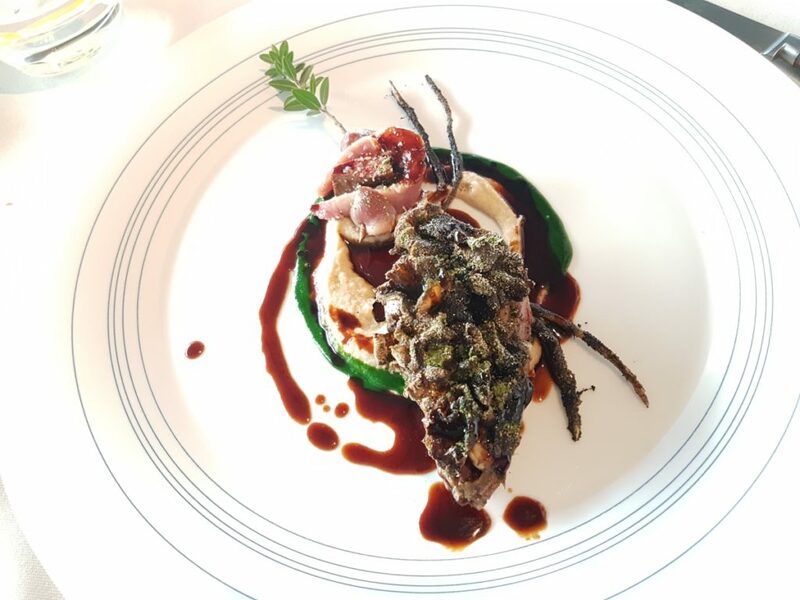 The hits kept on coming with roasted wild rabbit, port sauce and roasted artichoke. The cooking on the meat was spot on and the balance of the dish extremely deft. 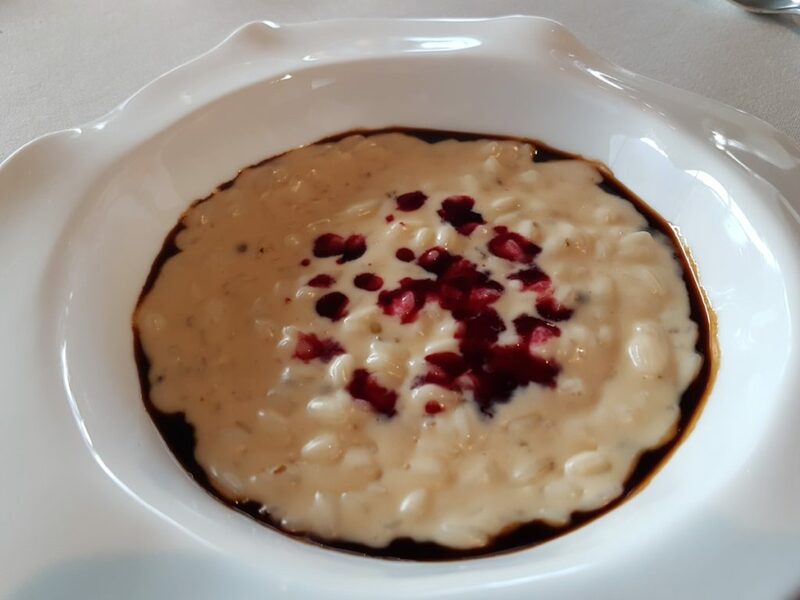 We then had quite an unusual intermediate course of rice pudding with rabbit reduction and pomegranate. It was oddly brilliant. 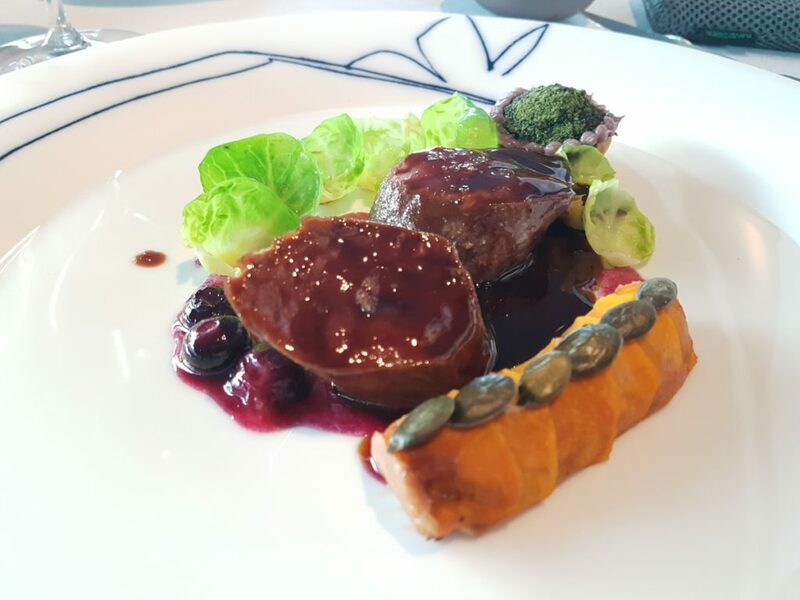 The main course was medallions of venison with pumpkin canolo and blueberries. 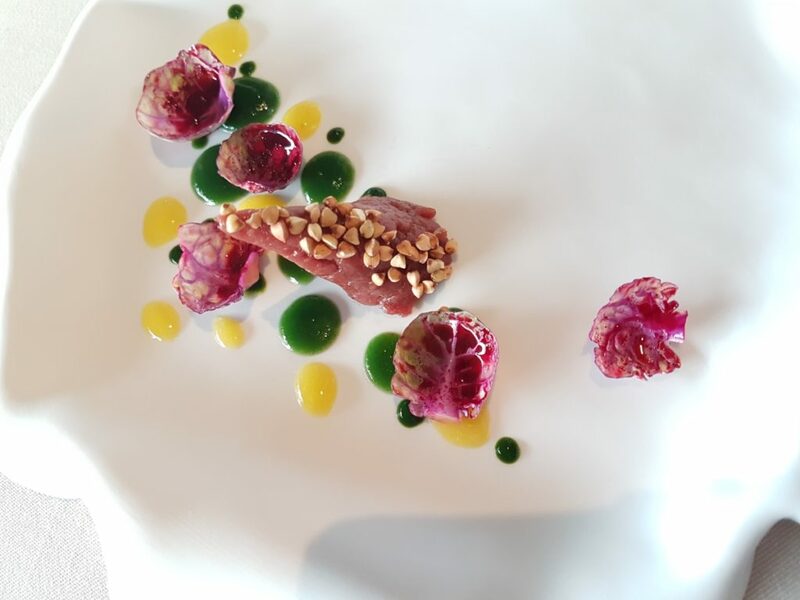 It was a fantastic showcase – as the whole menu had been – of the wonderful local game. This was served with a brown bread with fennel seeds and walnut butter. Both were excellent. 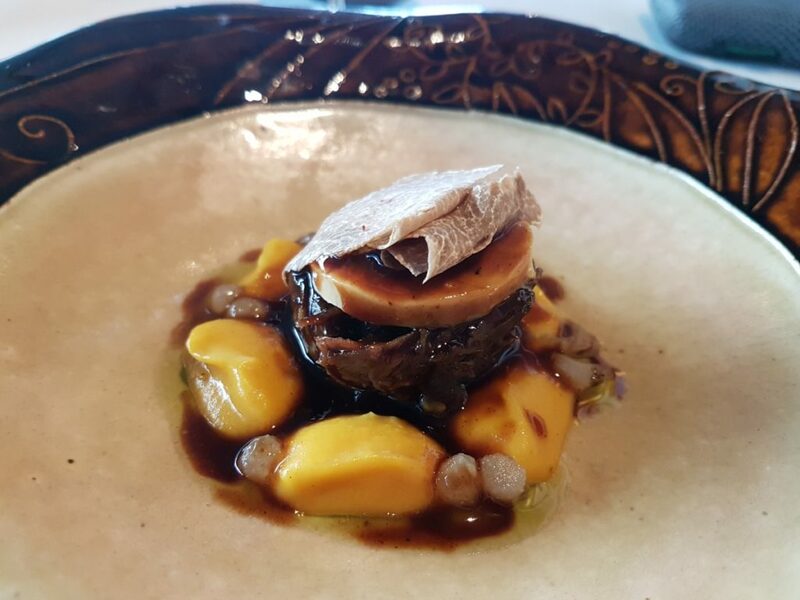 Chef sent out a little bonus course in the shape of oxtail topped with foie gras and white truffle. It was gloriously rich. 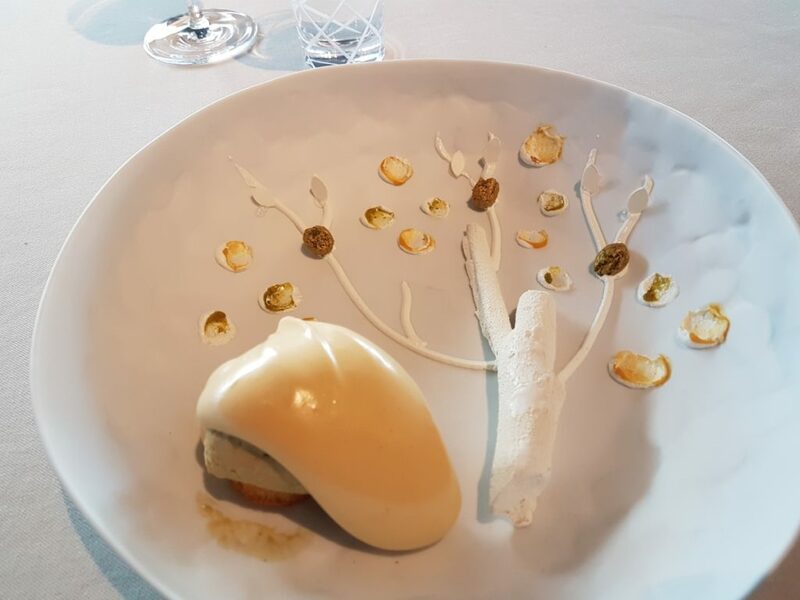 After a curious little dice game that involved me rolling a dice then eating it (me neither), the dessert course was a quite exquisite “orange tree” with traditional zabaglione and madeleines. It was next level. All the while, I’d had expert drinks matching from the sommelier who showcased an entire programme of excellent red wines in various styles. They were every bit as good as the food. Overall, Enrico Bartolini was one of the highlight meals of my trip. It was plenty pricey enough – breaking my single sitting record – but it contained some dishes that will be unforgettable. Next time you’re looking for a major treat, this is very much a place to consider and worth a trip to Milan just to sample its delights.